14 December, 2011. It was a Wednesday. With the first bits of my Backbone.Marionette plugin being available on Github now, I wanted to try out the Backbone-style of annotated source code as documentation. I like the way Backbone has this set up, and I often refer to it when I want to know how something works internally, or find a specific piece of code to copy. You can find the annotated code for Backbone.Marionette here. That being said… commenting your code is a great way to provide additional documentation. It will help people understand the code they are reading, and help them write better code using your library or framework. There are a number of different ports for this tool available, so you can run it in NodeJS, Ruby, Python, .NET and more. I decided to use the NodeJS version that Jeremy built, mostly because I’m always looking for an excuse to use NodeJS tools. The process of getting this up and running was surprisingly simple, though it did involve a few steps and a bit of guess work on my part. Hopefully this blog post will help others get around the guess work. If you read through the source code for Backbone.Marionette, you’ll find a bunch of standard // comments throughout the code. This is pretty normal stuff, for the most part. I’ve added some comments above my objects and methods, to help explain what they are and how to call them. Other than that, comment your code as you normally would. You can also do some cool tricks like using `bacticks` around code, and the generated document will encompass that inside of a <code> tag, with CSS set accordingly. There’s likely some other tricks you can do, too, as this is all run through a Markdown processor to build the docs. Side note: if you haven’t learned Markdown yet, do yourself a favor and learn it. 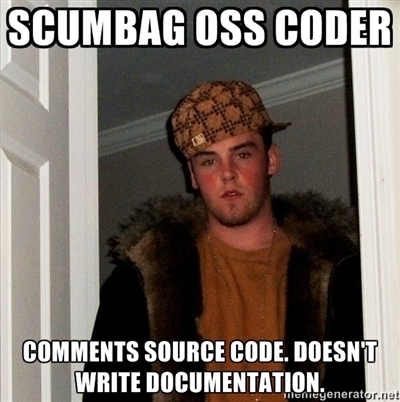 It’s becoming the ubiquitous documentation and code commenting style around the development community. I think this is largely due to Github supporting it and encouraging it’s use in readme files and Github wiki pages. I’m at the point where I take notes in Markdown, when attending technical sessions or taking notes from conversations. May be included in OSX… might be part of XCode. I’m on OSX Lion and I have the latest XCode. I didn’t need to install anything for Python to be available to me. Python is needed for the “easy_install” tool, which is Python’s package manager (similar to NPM or RubyGems). I’m not actually sure if you need to install the NPM pygments… I did, and things worked well for me. I’m assuming this is needed so NodeJS can run the Pygments tool. Now you have access to the `docco` command line tool.